﻿Voltaire ﻿Design ﻿Studio ﻿was ﻿founded ﻿in ﻿2014, ﻿originally ﻿to ﻿showcase ﻿and ﻿sell ﻿creative ﻿wares. ﻿Creative ﻿master ﻿mind, ﻿Kelly ﻿Belt, ﻿has ﻿been ﻿sewing ﻿since ﻿she ﻿was ﻿10 ﻿years ﻿of ﻿age ﻿and ﻿making ﻿jewelry ﻿since ﻿she ﻿was ﻿12. ﻿The ﻿older ﻿she ﻿got ﻿the ﻿crazier ﻿the ﻿ideas ﻿became. ﻿It ﻿was ﻿only ﻿when ﻿the ﻿projects ﻿out ﻿grew ﻿the ﻿family ﻿home, ﻿she ﻿moved ﻿moved ﻿into ﻿studio ﻿218 ﻿at ﻿Western ﻿Avenue ﻿Studios ﻿in ﻿Lowell, ﻿MA. ﻿It ﻿was ﻿at ﻿that ﻿time ﻿that ﻿she ﻿and ﻿her ﻿family ﻿started ﻿to ﻿vend ﻿at ﻿conventions ﻿and ﻿expand ﻿the ﻿collection, ﻿taking ﻿on ﻿larger ﻿projects, ﻿such ﻿as ﻿Phoenix ﻿wings, ﻿larger ﻿dresses, ﻿and ﻿doing ﻿leatherwork. ﻿Today, ﻿Voltaire ﻿Design ﻿Studio ﻿occupies ﻿multiple ﻿studio ﻿spaces, ﻿and ﻿is ﻿honored ﻿to ﻿work ﻿with ﻿clients ﻿from ﻿cos-players ﻿to ﻿brides. 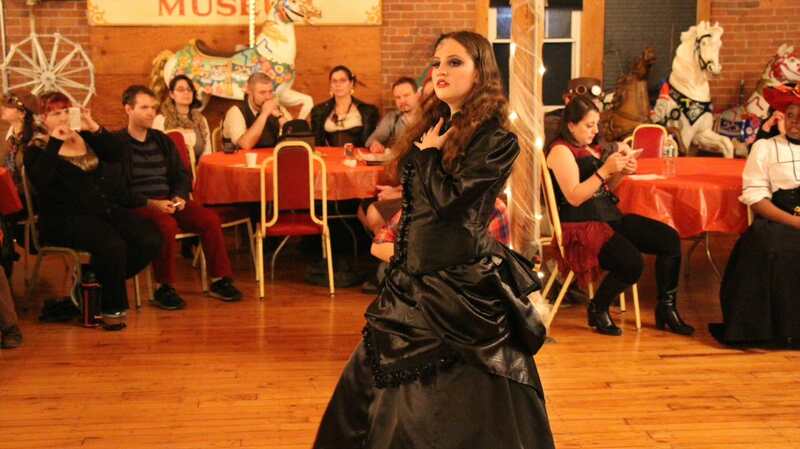 ﻿While ﻿we ﻿are ﻿as ﻿busy ﻿as ﻿ever, ﻿we ﻿take ﻿time ﻿to ﻿support ﻿the ﻿Miracle ﻿Providers ﻿Northeast, ﻿a ﻿charitable ﻿organization ﻿which ﻿raises ﻿money ﻿for ﻿children ﻿affected ﻿by ﻿HIV ﻿and ﻿AIDS, ﻿by ﻿participating ﻿in ﻿their ﻿annual ﻿Rocky ﻿Horror ﻿shadow ﻿cast, ﻿and ﻿Wearable ﻿Arts ﻿events. ﻿If ﻿you ﻿wish ﻿to ﻿commission ﻿us ﻿to ﻿bring ﻿your ﻿concept ﻿to ﻿reality, ﻿please ﻿Contact ﻿Us. ﻿Custom ﻿works ﻿are ﻿our ﻿specialty, ﻿so ﻿prices ﻿are ﻿low ﻿when ﻿compared ﻿to ﻿shops ﻿not ﻿setup ﻿for ﻿unique ﻿requests. © 2018,19 - Voltaire Design Studio, Inc.